Specs research compound libraries are available for download after logon to the Specs.net compound search website or by using the dedicated mirror FTP server. Compound libraries with compounds enclosed available directly from stock, are updated at the beginning of each month, holding the latest acquisitions and available quantities. Register as user here to access Specs.net using your personal account and download the most up to date version of your desired research compound library. 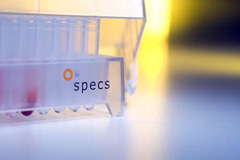 To request the current release of the Specs research libraries or to request a customized database without the need to create a personal Specs.net account, please fill out the form below. Feel free to add a comment for any desired specification (type of library, amounts, format, etc.) at the end of the form. Screening compounds currently available in 1 mg and more. Building blocks currently available in 10 mg and more. Natural products currently available in 1 mg and more.